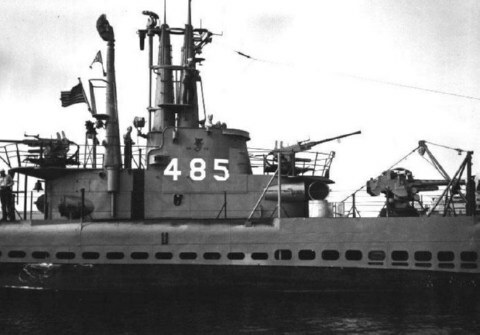 Sirago (SS-485) was laid down on 4 January 1945 at the Portsmouth Navy Yard, Portsmouth, N.H.; launched on 13 May 1945; sponsored by Mrs. L. Mendel Rivers; and commissioned on 13 August 1945, Comdr. F. J. Harlfinger, II, in command. Commissioned at the end of World War II, Sirago conducted her shakedown cruise off the east coast and in the Caribbean during the fall of 1945. After shakedown, she joined Submarine Squadron (SubRon) 8 at New London; and, in January 1946, she proceeded to Provincetown, Mass., where she participated in the destruction of two German submarines. On returning to New London, Sirago commenced duties which included training services for the Submarine School and for the fleet's destroyer force; experimental exercises to evaluate new techniques and equipment; type training; and fleet exercises which took her from Davis Strait into the Caribbean. In December 1948, she entered the Philadelphia Naval Shipyard for a GUPPY II conversion; and, on 25 July 1949, she left the yard for Norfolk where, as a modernized high-speed attack submarine, she joined SubRon 6. Attached to SubRon 6 for the next twenty-two years, Sirago's primary mission was antisubmarine warfare. Secondary missions included antishipping warfare, intelligence gathering, and the provision of services for research and development studies. Those duties, during the 1950's, continued to see her operating primarily in the western Atlantic as she participated in exercises with others of her ASW group; in fleet exercises; in joint Candian-United States exercises; and in NATO exercises, which took her into the eastern Atlantic and North Sea areas. During the 1950's, she also deployed to the Mediterranean where she operated as a unit of the 6th Fleet from September to November 1951 and from September to December 1954. In October 1962, Sirago entered the Norfolk Naval Shipyard for another extensive overhaul which included the installation of a fiberglass superstructure and sail, and, in the spring of 1963, she resumed operations with her ASW group, Task Group "ALFA." That fall, she deployed to the Middle East for CENTO exercise "MID-LINK VI"; but, during the remainder of the 1960's and into the 1970's, her operations were similar to those of the 1950's. On 1 July 1971, Sirago was reassigned to SubRon 12 at Key West; but, less than four months later, on 15 October, she was ordered back to Norfolk where she rejoined SubRon 6. She remained in that squadron until decommissioned on 1 June 1972. Struck from the Navy list on the same day, she was turned over to the Naval Ships Systems Command and sold for scrapping to the Jacob-son Metal Co., Chesapeake, Va., on 2 May 1973.